Will US FIFA Indictments Lead to Reform? The FIFA indictments of 2015 and the Salt Lake City Olympic Committee scandal of 1998 share an important characteristic: both were the targets of a corruption investigation by the U.S. Department of Justice. The FIFA indictments triggered outrage against the U.S. Justice Department from some quarters for overstepping its bounds. But for U.S. legal scholars, an indictment boils down to two questions: Was a crime committed on U.S. soil? Secondly, is there a basis for personal jurisdiction over the individual or individuals involved? “It's not unlike someone who stands on U.S. soil and intentionally fires a weapon to murder someone in a foreign country and succeeds. It's true that the dead body is in the foreign country, but the act that was the crime, and the intent, all happened in the U.S. The crime happened here,” explained Jennifer Arlen, a New York University law professor. Arlen said this type of case, involving bribes paid through U.S. financial institutions, is not uncharted territory for the United States. The FIFA executives indicted include, top, from left, Rafael Esquivel, Nicolas Leoz, Jeffrey Webb and Jack Warner. Bottom, from left, Eduardo Li, Eugenio Figueredo and Jose Maria Marin. ​She said the Justice Department has aggressively pursued both foreign and domestic bribery for more than a decade -- including the Salt Lake City Olympic Committee scandal of 1998, involving bribes for the rights to host the 2002 Winter Games. Alexandra Wrage, an expert in anti-corruption compliance, was a member of FIFA’s Independent Governance Committee until she resigned in 2013. 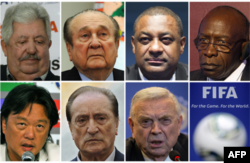 Wrage told VOA she believes a culture of bribes and kickbacks has persisted at FIFA for so long in part because it was seen as the normal way of doing business. “When you have this closed circle, with no independent oversight, no independent board members like corporations and others have now, I think it's really easy to have this mentality that's it's going to be business as usual, and that's been going on for a long time at FIFA,” Wrage said. Wrage said that if FIFA truly wanted to reform itself, it would have done so by now. “What happens instead is that Blatter talks about reform at intervals whenever the pressure builds and it fades back again into the background,” said Wrage. Sepp Blatter, who has served as FIFA’s president since 1998, remains under investigation. He has agreed to step down once a successor is named, but continues to maintain his innocence.